Wherever we go, someone is constantly asserting the life of loneliness, isolation and lovelessness to which fat people are doomed. It is heartbreaking and it is false. I think about the technicolor loves I have had; the partners who have loved and wanted me. I think about the fat people I have fallen for; thefat friends and family who are happily married, hooking up, falling in love, and calling affection into their lives. Unlovable is ubiquitous and so deeply untrue. After all, if fat people were truly impossible to love, two thirds of the country would be condemned to a life of solitude and longing. But unlovable has gained so much momentum that it has taken on a life of its own, a self-fulfilling prophecy that it shapes the thinking of my friends and family, showing up jagged and sharp in their tender mouths. Even friends who are critical about popular depictions of fat people have a hard time. When we talk about Fat Chance, their answers are startlingly similar. One after another, upon seeing the contestants: I mean, look at her, she’s not even that fat. I know that’s not what they intend to say. They mean the world has gone haywire if this woman is considered fat. They mean an impossible standard has been set if a handsome, broad-shouldered man feels like he’s too fat. They are startled, seeing bodies that look so much like theirs being discussed as irredeemably, unlovably fat. It’s a common response to seeing fat shaming of all kinds. She’s not that fat.Because if she is, they might be, too. They are awakened to a new level of self-consciousness, wondering if maybe they should’ve felt even more ashamed all this time. In that moment, they disappear into themselves, consumed by a new depth of surprise and shame. She’s not even that fat. But I am always that fat. When strangers bring up cartoonish numbers — I mean, would being fat be okay if she was 300 pounds? — I am their exaggerated example. I am the person they dread sitting next to on the plane; the one whoavoided eye contact with strangers for fear of the slurs that would follow; the one who ordered salads in public in hope of being spared judgment, comment, or shaming. I have always been that fat. I have always been fair game. She’s not even that fat. But they’d understand if they were saying it about me. She’s not deserving of such scorn, but there’s someone who is. There’s someone who’s that fat. There’s me. I wanted to tell you, my darling friend, that your identity is important. When you say you are pretty fat, I believe you. I believe that you see yourself as pretty fat, and I know that your identity matters to you just as much as mine matters to me. The way you see yourself shapes how you engage with the world around you. It determines when & how you feel seen, when & how you feel erased. You describe it precisely, with words you cradle close to your heart. It is a locket that warms with your body; a keepsake to remind you who you are, and where you stand in the world. But your identity lives an internal life, beats its wings beneath your breastbone. Your identity may not be how you’re seen by those around you.That’s perception. And perception creates experience. Your identity matters deeply. So do perception and experience — how others see you, and how they treat you as a result. Your identity shapes how you engage with the world; perception determines how that world reacts to you.This, dear friend, is where our experiences differ. You feel pretty fat. I am seen as that fat. Because I’m seen as that fat, I’m treated with all the dismissal and contempt that people who are that fat deserve. People who are that fat get turned away from job interviews, promotions, even doctor’s offices. Because I am that fat, a nurse takes my blood pressure four times before telling me that my low blood pressure “can’t be right — not for an obese patient.” You know yourself to feelpretty fat, but cashiers don’t gawk when you walk into a buffet restaurant, andacquaintances don’t joke about ending up on a blind date with someone like you. You see yourself as fat, and that matters. But the world around you doesn’t know how you see yourself. They only see the body in front of them, and that body isn’t even that fat. Both of these moments, with good friends who I love and trust, have stayed with me. Both friends are thoughtful, incisive, committed to doing better by fat people. And in both cases, their values were betrayed, caught in an undertow of dismissing fat people. They never meant to, but both of them made it clear that some bodies are acceptable, and others aren’t. 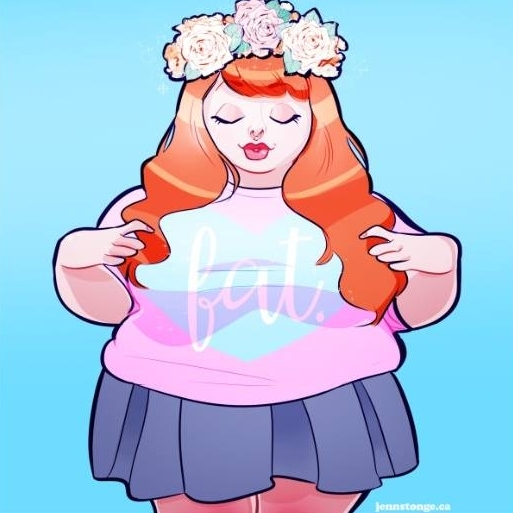 Many of us are comfortable saying that some fat bodies are okay. Those fat bodies are almost always exceptional, star athletes or stunning models. The kind of bodies you see alongside their accomplishments and, astonished, utter, I never would’ve guessed. The kind of bodies that check every other box: staggering beauty, visible markers of health, physical ability, youth. Women must have hourglass figures; men must have broad shoulders and barrel chests. No one can “look obese.” Yes, fat bodies are okay, but only if they are immaculate in every other way, and only if we can see their perfection. Fat bodies are best when they don’t look fat at all. She’s not even that fat and I’m pretty fat are harsh reminders of that line. I never know just where it is, but I know I am always on the outside of it. I have never been an acceptable kind of fat. Those who are acceptable, those who are embraced, are precious few and far between. Most of us fail at being the right kind of fat. That’s why any acceptance of fat people that expands our standards to a pointis unacceptable. I do not want to be accepted into a beauty standard that has betrayed me. I do not want my acceptance to rely on someone else’s rejection. Everyone — yes, everyone — deserves respect in the world. No one — not one person— deserves to be harassed, discriminated against, disrespected or hurtjust because of the size or shape of their body. It doesn’t matter if you think they could change their body. It doesn’t matter if you’re right. All of us deserve safety and all of us deserve love. And this, my darlings, is where the work gets tough. There will be bodies that you find difficult to embrace: the fattest person in the movie theater, daring to eat popcorn. The person you clock as transgender at the grocery store. The person with a visible disability, who needs you to give up your seat on the bus.There will be me, a person who is that fat. Dignity is not earned. Safety is not a reward. None of us should have to overcome our bodies just to be safe, to be loved, to be treated like anyone else. Safety, acceptance and love are for all of us. Not just the ones we’re comfortable with. Not just the ones who aren’t that fat.